Quiz: Should You Stay or Should You Go? Things aren’t ideal at your current salon. Should you stick it out or pack your sculpting brushes and make a clean break? Take our purely unscientific quiz to reveal the clues. a. Get ready to tackle the day, full of new ideas to implement. b. Feel uneasy. Every day is different and you hope this is a good one. c. Dread going in to work. d. Quick, think of an excuse, call into work, and go back to bed. a. Tell her the name of the salon and give her a business card with your preprinted contact information. b. You tell her that you are in the same place and write your cell phone number on a piece of paper for her, promising to get together for coffee. c. You roll your eyes and proceed to share an incident that happened just this week. d. You immediately ask if the salon she works in is hiring. a. Offer to help her catch up. After all, you support each other to make the salon run smoothly. b. Pretend you don’t notice, since this is happening far too often and you have your own work to worry about. c. Pull your manager aside to point out that the coworker is putting the salon at risk and making everyone look bad. d. Do nothing. You have tried in the past and it doesn’t change anything. You continue to make a production of sanitation hoping it won’t scare away your clients. a. Wonder what the odds are of a new salon lasting in that location. b. Briefly ponder what it would be like to start up in a new salon, then go back to your regular day. c. Write down the phone number and do some research about the owners. d. Go straight home to prepare a resume to submit the following day. Anything is better than the current situation. a. Write it up and present it to your manager. The salon needs some positive exposure. b. Think about it but are not sure it is worth cultivating new clients where you are. c. Write it down and save it for when you open a salon of your own. d. Bury it deep. Dental hygienist school is looking pretty good. a. Are eager to mentor her and help her integrate into and strengthen the team. b. Are torn between helping her settle in and handling your own clients. There have been too many new technicians lately. c. Aren’t sure what to do. There haven’t been enough new clients coming in lately and this new technician threatens your income. It means less business for you. d. Are tempted to tell the new technician, “Wow, did you choose the wrong salon,” but decide to do nothing. a. Managing the current salon and overseeing an expansion. b. Having a steady clientele in the current salon and pursuing management. c. Probably working in another salon. d. Owning my own salon or managing a trendy new salon with cool new services. a. Just steer clear of the conflict and ride it out. You have seen this before and the hotheads normally don’t stick around long. It’s not worth jeopardizing your clientele. b. You talk to your supervisor again to emphasize the negative impact and perhaps adjust your schedule. c. You start thinking about taking your gear home at night, since some days you just don’t want to go back. d. You prepare to leave and start sending out applications immediately. a. Look forward to getting together with coworkers to unwind. b. Socialize with a couple of close friends from the salon. c. Clean up and leave quickly most days, homeward bound. You will see them soon enough. d. Scoop your stuff and run, barely making eye contact or saying goodbye. And forget doing anything with coworkers on your off time! a. Try to find something nice that anyone in the salon would love — perhaps a gift certificate. b. Do the same thing you always do — wrap up a $10 bill. c. Look around the house for something you don’t want that would be appropriate. This is not high on your priority list. Who has time? d. Are going to have a headache that day and will not be attending. a. I’m in a good place. No place is perfect but I can make a career here. b. My salon has real potential but I’m not sure if it is the place for me, long-term. c. I’m having a hard time making it work in my current location and I’m open to suggestions. d. I’m out of here! You might work in one salon or 12 in your lifetime. This may be a first or third career. There is no one right way to find the perfect fit. You do your research, jump in and give it your best try. Chances are good you knew when you read the title of this quiz exactly where you stand. Should you stay or should you go? Add up the numbers to find out. 11-16 points: You are probably in a good place for now. There is room for improvement and likely an environment of camaraderie. No major red flags appear that signal an immediate exit in your future. 17-30 points: You are on shaky ground. There is definite room for improvement. Whether that improvement is in this salon, or in moving on to another, only you can know. Pay attention to the situations that are incongruent with who you are. If the situation does not improve with some effort, it may be time to think about moving on. 31-44 points: You have one foot out the door. It is time to do some serious soul searching about where your heart is. 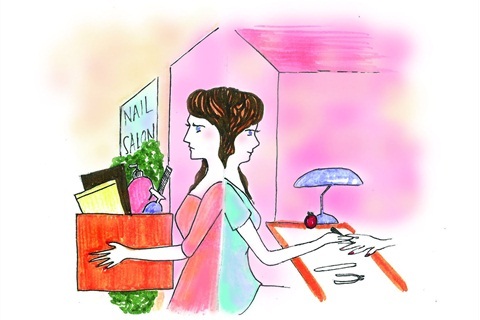 Have you outgrown your position and yearn for a salon of your own? Are you creatively hampered or matched up with the wrong set of personalities? Whatever it is that has you feeling disassociated from your current salon needs to be identified before you land in your new spot. It’s a chance to have a shiny new beginning.